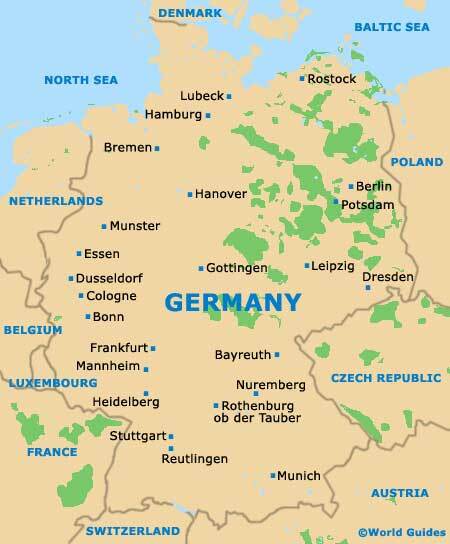 The Federal Republic of Germany is situated in central Europe and since the fall of the Berlin Wall and the collapse of communism in eastern Europe in 1990, both East and West Germany have been reunified. There is a wealth of accommodation in Germany to suit all travellers including budget lodging, travel lodges, bed and breakfast and luxury hotels. Places to visit in Germany are endless and there is something to suit everyone with sporting venues, museums, landmarks, monuments, festivals and quality shopping. Germany has a long and rich history and there are numerous places of interest to visit that include Hamburg, Munich, Bavaria. Cologne, Frankfurt, Essen, Dortmund, Stuttgart, Düsseldorf, Bremen, Hanover, Lübeck and the Rhine Valley - with its breathtaking scenery. Berlin, the capital of Germany, is built around the River Spree in Bundesland, and visitors to Berlin can enjoy a wealth of spectacular tourist attractions. The city of Berlin, Germany is built around the River Spree in Bundesland, the federal state of Brandenburg. Berlin is Germany's capital city and has undergone enormous changes in the past 100 years. It is now a very exciting city to visit. A very friendly city where people come to relax and soak up the atmosphere, Bonn is famous for many things and is actually the birthplace of German composer Beethoven. The noteworthy National Parliament buildings are located here. Known in Germany as Koln and situated in close proximity to Bonn, Cologne is the largest of all the cities within the North Rhine-Westphalia area. This is a historical and rather beautiful city, with some magnificent buildings lining its Rhine River. The capital of the Saxony state, Dresden city has some very attractive scenery and has grown up around the meandering River Elbe. Dresden has endless Baroque architecture, with the Altstadt district being where the main sights reside. The modern and energetic city that is Dusseldorf boasts much traditional character, if you look past its glamour, sparkle and gigantic trade fairs. Today, Dusseldorf is overflowing with culinary delights, top nightclubs and sights to see. Known to Germans as Frankfurt Am Main, since the city actually lies either side of the Main River, Frankfurt is a city of finance, culture and tourism. Home to the Germany stock exchange, the skyline bears many similarities to Manhattan. Second only to Berlin in both size and also population, there is no question that Hamburg is an impressive city, with much to offer its visitors. Highlights include the red-brick buildings in the Merchant's District and the Speicherstadt canals. Home of the very prestigious Ruprecht Karl University of Heidelberg, this city is extremely tourist-friendly. Visitors can enjoy a cruise along the Neckar River, a ride on a funicular railway, and some historic castle ruins known as the 'Schloss'. A dynamic city with leading trade fairs and a number of traditional German restaurants, Leipzig also boasts some outstanding opera houses and concert venues. Leipzig is a cultural university city with a network of winding rivers. A very charming and picturesque city, Lubeck contains some spectacular Gothic buildings, although for many, it is Lubeck's tasty marzipan that is best remembered. The 15th-century Holstentor gateway is always a favourite. Filled with traditional Bavarian character, the German city of Munich is actually the state capital. The centre of Munich comprises a series of historical structures, such as the famous Town Hall and the Cathedral of Our Blessed Lady (Frauenkirche). The second-largest city in Germany's Bavaria state, Nuremberg is a spirited city, which has successfully left its strong Nazi legacy in the past. Nuremberg is a forward looking city and hosts some spectacular seasonal festivals and events. A charming Bavarian town enjoying a pretty hilltop setting, Rothenburg ob der Tauber comes with a quaint medieval Old Town (Altstadt) comprising cobblestone streets and part-timbered houses brimming with character. A mega-city encircled by a series of satellite towns, Stuttgart resides within the state of Baden-Wurttemberg, where it serves as the capital. The Old Castle (Altes Schloss) and the historic Bohnenviertel area are notable highlights. Electricity: 220 Volts AC, 50 Hz - flat two-pin plugs or third round pin are used American and British appliances require an adaptor for use in Germany.